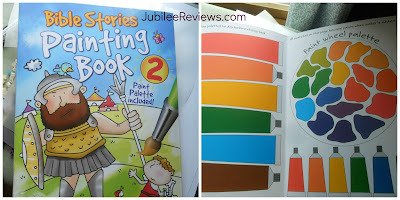 Bible Stories Painting Book 1 and Bible Stories Painting Book 2 are two fantastic painting books that are easy to use with no mess involved! Each book has sixteen scenes from the Old and New Testaments with a simple line of text explaining the picture. Simply dip your brush in water, wipe over the paint pallets on the inside covers and fill in the illustrations with bright, bold colors! I fondly remember those coloring books with the paint already on the picture and all you need was a wet brush. 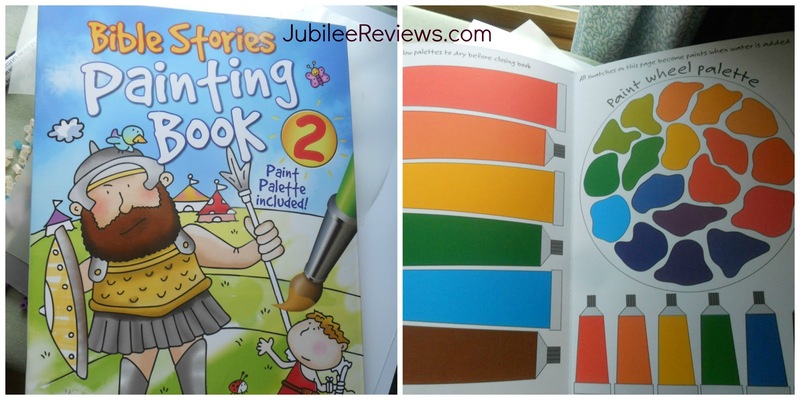 This takes that concept a step further and allows the child to paint with the color palette on the pages of the book! No need to worry about having paint on hand, a great book to take along with you on your travels.. just be sure to allow the paint page to dry before folding it back up! This one was a little harder to use for us. You do have to tear out the page you want to use, just so you don't get paint on all of the other pages. They are printed on both sides which I found a little bit odd. Typically you can only paint on one side of the paper. I was surprised to see that if you don't use too much water, the paper is actually thick enough that you can paint both pictures without the water going through to the other side. My kids love to paint an I usually let them but this would make it a lot easier!